As we’ve seen evident with the latest batch of Android powered Motorola smartphones, they’re running the most up-to-date light version of MOTOBLUR that was first introduced by the Motorola DROID X last year. Increasingly, we’ve seen fewer devices relying on the full-blown MOTOBLUR experience, which requires you to log in with an account before getting things set up. Well, it appears that the company is quietly steering away from using the MOTOBLUR moniker with their products – especially when it wasn’t uttered even once in the press materials for the Motorola PHOTON 4G and TRIUMPH. 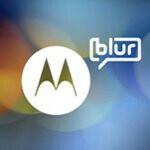 Moreover, a Motorola spokesperson went on to confirm that the company is steering away from the MOTOBLUR name. In fact, it isn’t the first time we’ve heard of such things, because it was actually mentioned by Motorola’s very own Sanjay Jha last year. In actuality, the choice was made primarily due to some public feedback they received about it – albeit, some parts of its social networking aspects will continue to live on with future devices. I may be in the minority but I do like the Motoblur light UI that's on the X, I like the social networking features and the widgets that come with it. Not perfect but it's nice. Hopefully they keep the positive things. As improved as a UI as it is, the negative press it has taken may be a bit of a drawback. Still, Moto has had a ton of success with high end devices, so moving away from something with the name so linked to it is unusual. Usually, companies would just push "new and improved" promotions onto something. You obviously haven't used new Blur, like what's found on the DROID X2 and Gingerbread DROID X.
I agree motoblur does bog down phones theres no reason a phone with a 1g cpu should lag and theres been reports the DX2 had some lag issues! I believe all due to motoblur! A phone with a dual core cpu should have no lag its unacceptable. Its unanimous when it comes to blur people dont want it so i hope this article is stating that motorola is finally listening to their customers and doing away with their buggy UI! That was one of the main reasons people loved their D1s NO BLUR!! theres times my D1 was way less laggy and twitchy than my DX which shouldnt be the case considering my X has almost twice the processing power hence the reason i hate blur!!! If you've downloaded Gingerbread on your X, you'd know that the lag issues are virtually gone. And the reason the X2 still lags is because it's still on Froyo. Thats funny...cuz after just changing the launcher and lock screen on my Droid X1...it was not laggy and as smooth as my Droid 1 with Launcher Pro or ADW. Sometimes ppl associate the Blur launcher and lock screen with the entire Blur UI. Do you remember when Froyo came out for the Droid 1, officially? Know whats the very first thing alot of us did? We got rid of the stock Android launcher and used Launcher Pro or ADW. Even the stock Android launcher is was no match for LP or ADW.And one of the main reason ppl loved the Droid 1 was it was a waaay better alternative to the old Win Mo, or BB, or Palm phones when the Droid 1 and Eris came out. Only the ppl that loved stock Android loved that it didnt have Blur. Most ppl dont even know what a Blur is.. The only thing ive liked from motoblur is the adjustable widget sizes, and the Motorola keyboard. Me to. You can adjust the size of the widgets on the samsung galaxy sII, but i hate the keyboard on the phone. Wish there was a pefect phone out there..
why not just change the keyboard? you realize there is like 50 keyboards in the market right? Swype, gingerbread, swiftkey, dragon, big keys, ect ect ect. If you dont have a keyboard you like, its not the phone's fault. I like stock android over any skin anyway. Updates come faster and besides gingerbread brings a lot of functionality that was lacking before so I see ice cream going even further. Motoblur has improved a lot since its horrible intro with the devour but it still looks very cartooney compared to the new sense and touchwiz. I kind of like the name "Blur," but if Motorola is being smart about marketing and getting rid of a name that has negative connotations now, then I won't stop them. I know for a fact that they have made incredible leaps and bounds with New Blur, almost to the point where it isn't even the same skin anymore. I agree. It is very sharp and smooth. If they were going to rename it, shouldn't it just have been a part of the "X2" or even the Atrix launches, even before the Sprint gala? Strange. If you find stock boring, you can download launchers. Most of them are free or little charge. Also stock allows faster updates to the next version of android. Not to mention stock runs smoother and faster due to heavy skins like motoblur caused a lot of lag issues and other bugs in the early builds. I think after ice cream skins won't be needed. Good decision Moto. Focus on a more aesthetically pleasing UI like what HTC Sense has done with their lines. I've always enjoyed their hardware but can't take their software unless it was stock. The Samsung Galaxy S2 is the most powerful android phone on the market right now. I don't know if it is due to the 1.2GHz processor it's running or maybe a combined effort thanks to the new touchwiz 4.0. Either way, I really like how Samsung has made the phone lag free even with heavy flash running, it still can pinch to zoom effortlessly. Sense and Motoblur have improved a lot as well, but right now IMO Samsung is the champ.